This news is redirected by SCIENCE from UCPH News. Judging by satellite imagery, our planet has become greener. Until now, this was thought to be the result of trees and plants relishing in ever-increasing levels of atmospheric CO2. But now, a University of Copenhagen researcher, together with colleagues from around the world, have identified intensive agriculture as the primary cause for what had appeared to be a greener planet. The findings may have implications for how climate models are built. Satellite imagery has allowed researchers to witness a net growth in the amount of planet Earth’s leaf cover for many years. In other words, areas with green-leafed plants and trees have become more lush and expansive. Until now, scientists believed that this was primarily due to increased levels of atmospheric CO2 boosting photosynthesis, producing a fertilizing effect for plants and trees. 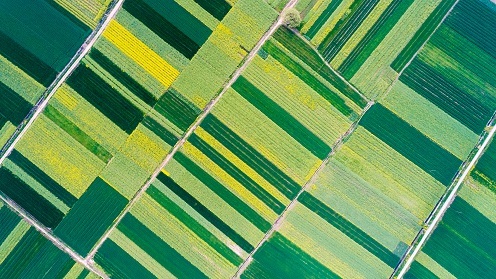 Now, an international team of researchers has demonstrated that a surprisingly large proportion of the areas of increased planetary greenery are made up of agricultural crops. "Our results weaken the prevailing theory that increased CO2 in the atmosphere has made the planet greener. Much points to specific agricultural areas in certain countries being the crucial determinant. We’re taken aback, because we had anticipated finding the largest increases of green spread evenly across global forests," says Professor Rasmus Fensholt of the University of Copenhagen’s Department of Geosciences and Natural Resource Management. Fensholt belongs to a research group that uses enhanced satellite data and improved analytics to investigate why there has been a roughly 5.5 million km2 annual increase in leaf growth from 2000-2017. The new analyses demonstrate that crops such as fruits and vegetables account for at least 33% of the increased amount of green on the planet, making agriculture the largest single contributor to the global greening. The intensification of Chinese and Indian agriculture in recent years is largely the cause of greening. Combined, the two countries account for one-third of the planet’s total greening, despite their comprising only 9% of Earth's vegetated surface area. According to the researchers, it is this asymmetry that sheds doubt on the degree to which CO2 really has on plant growth on a global scale. "If the increase of greenery was due to a CO2-effect, one would see a more even distribution across the planet. Instead, we see that the increased vegetation is concentrated in small geographical areas that run nearly flush with borders," explains Rasmus Fensholt. Research also shows that the increased amount of agricultural vegetation is not caused by a fertilizing effect from CO2, but from factors such as fast-growing hybrid varieties, better seed quality, irrigation and mechanization. Because trees and plants play an important role in absorbing atmospheric CO2, scientists anticipated an environmental gain from greening. More green leaves results in more CO2 absorption. Unfortunately, the impact of these expected gains has now shrunk. "On the surface of things, a greener planet sounds good, because it means that more carbon could bind with vegetation. But since the increased amount of green consists of crops, the gains are eclipsed because CO2 is released when vegetables are harvested. On the other hand, trees are able to store CO2 for decades, until they rot or are burned, depending on their use," explains Fensholt. "The role of agriculture in global vegetation is much more important for future climate scenarios than we had previously imagined. These results disrupt our understanding of how humans influence the amount of CO2 sequestered in Earth's vegetation, and how much is found in the atmosphere. It is knowledge that can contribute to more accurate predictions about the effects of climate change on Earth's ecosystems. " The research results have just been published in the scientific journal Nature Sustainability (link: https://www.nature.com/articles/s41893-019-0220-7). This article was written by Maria Hornbek.